For Jambites who are considering or are interested in gaining admission into a top university in the country, how about the Nnamdi Azikwe University? Here’s an informative piece that tells you all about the school and what you need to know before you choose to apply for the school in your next Jamb. Nnamdi Azikwe University popularly known as UNIZIKis a prestigious federal university located in the soiuth eastern part of Nigeria, Anambra to be precise. UNIZIK is a prestigious university that accommodates some 25,000 students including part time, and admits thousands more yearly. O’level requirementsè minimum of 5 SSCE credits from either WAEC, NECO or NABTEB at not more than two sittings in English, literature in English, and 3 other subjects that relates to your course of choice. O’level requirementsè minimum of 5 SSCE credits from either WAEC, NECO or NABTEB at not more than two sittings in English, Mathematics, physics, chemistry and any other science subject. O’level requirementsè minimum of 5 SSCE credits from either WAEC, NECO or NABTEB at not more than one sitting in English, Mathematics, physics, chemistry and biology. O’level requirementsè minimum of 5 SSCE credits from either WAEC, NECO or NABTEB at not more than two sitting in English, Mathematics, physics, and any other 2 science subjects except for fine & applied arts. O’level requirements is same as that of medicine and Pharmaceutical Science. Two sittings allowed. O’level requirementsè minimum of 5 SSCE credits from either WAEC, NECO or NABTEB at not more than one sitting in English, literature and any other 3 art/social science subjects from commerce, government, economics, French, business studies or account. O’level requirementsè minimum of 5 SSCE credits from either WAEC, NECO or NABTEB at not more than two sitting in English, Mathematics, chemistry, biology and any one from physics, physical and health education or any other science subject. O’level requirementsè minimum of 5 SSCE credits from either WAEC, NECO or NABTEB at not more than two sitting in English, Mathematics, chemistry, Physics and other science subject. O’level requirementsè minimum of 5 SSCE credits from either WAEC, NECO or NABTEB at not more than two sitting in English, maths, literature in English and 3 other social science related subjects. O’level requirementsè minimum of 5 SSCE credits from either WAEC, NECO or NABTEB at not more than two sitting in English, maths, and 3 other subjects related to preferred course of study. If you successfully score above the Jamb cut-off mark then you are eligible for the post-utme exam to be conducted by the school. Formerly the school conducts a paper based test for her prospective students but the school authorities announce that as from September 2015 post-utme exams will be computer based, candidate should not be new to CBT tests as this is the also the pattern jamb employs for her test. 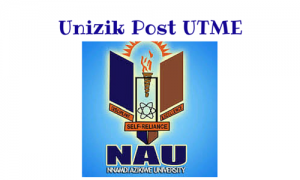 UNIZIK also uses biometrics information gotten directly from JAMB for validation and accreditation of candidates. The Nnamdi Azikwe University conducts a Pre-science programme, referred to as pre-degree in some other schools. The application form is sold for 8000 naira and can be purchased from any bank within or outside the awka campus. The pre-science programme grants admission to students based on applicant’s qualification i.e. complete O’level result. School fee is about 40,000 naira for candidates who made their o’level in one sitting and 45,000 naira for candidates who are combining two results.